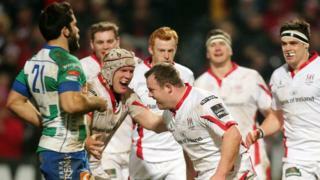 Ulster score six tries in a 43-3 bonus-point victory over Treviso which moves them up to second in the Pro12 table. Michael Allen went in for the solitary try of the first half and the remaining five came in the final 20 minutes. Craig Gilroy, celebrating his 100th Ulster appearance, bagged a double while there was also a penalty try and touchdowns from replacements Stuart McCloskey and Andrew Warwick.